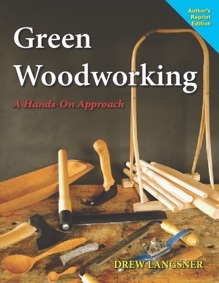 Green Woodworking and The Chairmaker’s Workshop are available directly from Drew. Both books are Author’s Reprint Editions, with numerous updates and corrections from the original commercial publications. Click on either book cover (left) for a sample pdf. S&H for U.S. orders is $5.00 for 1 book, $7.50 for both. A dated autograph is included. Payment by personal check. Order by postal mail addressed to: Drew Langsner, 775 Black Pine Ridge Rd., Marshall, NC 28753. I am currently working on a greatly revised and enlarged version of my 1978 book Country Woodcraft. Contents will include almost all of the original edition (with the classic black and white photographs) plus extensive updated material on shaving horse and workbenches, carving bowls and spoons, tool sharpening and much more. The new edition, titled Country Woodcraft – Then and Now will be published by Lost Art Press, hopefully in late 2019. If you understand German, or like to find rare books, look for Holzarbeiten Für Das Alternative Landleben (Volksverlag), and Das Grose Buch vom Stuhlbau (Verlag Th. Schäfer). by clicking the PayPal logo at left.